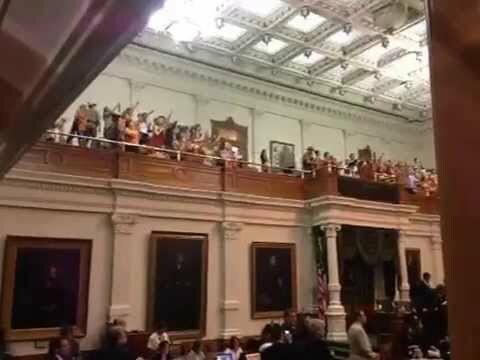 This is the “gallery filibuster” — shouting by pro-choice advocates in the Senate halls after Democratic Sen. Wendy Davis’s filibuster was shut down– that so delayed the vote on a proposed law virtually banning abortion in Texas that it took place too late to be valid. After a marathon filibuster by Democrat Wendy Davis was cut short, the Texas senate voted on a bill crafted to shut down almost all of the state’s abortion clinics. Democrats say that the vote came after midnight, making it void. Republicans insisted that it is valid. But early Wednesday morning, the state’s Lt. Governor declared that the vote came too late to pass. Texas Republicans disregard the Supreme Court on this issue, but are delirious about the court’s gutting of the Voting Rights Act yesterday. The Young Turks explains the new Texas abortion law and its implications.